Target stubborn brown spots, red marks and wrinkles. This innovative spot treatment contains a high concentration of 25% ascorbic acid (Vitamin C) to visibly improve uneven skin tone, red marks and skin texture. The silky formula reduces fine lines and leaves skin hydrated, softer and visibly brighter. At night, apply as the last step in your skincare routine. Gently pat (don’t rub) onto brown spots and wrinkles. For daytime, always follow with a moisturiser containing a broad-spectrum sunscreen rated SPF 30 or greater. Customer Care: Thank you for sharing your experience with us - we're sorry to hear this didn't work as expected for you! Please contact a member of our Customer Care team, who can assist you with finding a possible alternative. Emanuela - It really works! This stuff really works. My skin looks more even, my really old dark spots (sun damage) are really fading! I have to mix it with my moisturiser though, cause I hate the texture, when I tried to apply it on top of my moisturiser, it goes all bobbly and does not stick to the skin, does not sink in, andalso it is really expensive. These are the only reasons I gave it four stars. 1, fade out those red marks caused by a spot - works very well on newly healing spots but for old ones, the progress is slow. 2, Around the eyes every other night to help with wrinkes and it works quite well. Unbelieviably expansive for 15ml of product. Once I've used my second tube I'll decided if its worth the investment. I have tried every high end department store brown spot lightener for 6 months at a time and some worked a little, most didn't. This one has made a real difference to lightening my stubborn brown spots (sun damage) over my cheeks. Skin feels powdery soft and clearer as the lighter brown spots are almost gone. The big brown splotches are lighter too which is amazing since nothing else worked! I have only been using it for 2 weeks. Quite impressive! It causes mild itching for a while but it is not a problem as I have experienced worse with prescription retinoids. Also, very little is required so the little tube will last a long time. I will definitely buy it again. Well done PC! I've been using this for hyper pigmentation for 6 weeks now, with no visible improvement. It also has a thick powdery finish which is fairly unpleasant and, even if you carefully pat it on (as recommended), I find it balls up and is visbile on your skin. Really disappointed as this is a very expensive product (though luckily I decided to buy the trial size!). Won't be reordering! I bought the sample size of this,and it is very small for £20. You really don't need much of it though as it's quite powerful stuff. I'm not sure if it has actually doing anything for my pigmentation,I will use up the tube to see if it makes any difference. Very expensive, but it's worth it if it works. May report back on this one. I mixed this with the oil booster and all I can say is my skin complexion in the morning and the whole day has just been glowing. I use this on a fortnightly basis and use the 1 per cent retinol on the other week. This and PC foundation in the day just makes my skin happy. The cost of this is ridiculous and the delivery is rubbish - four working days. As for the product, this is one that will take time to deliver noticeable results, but it is nice to use and didn't irritate my skin at all. The product is good but the price and delivery is not good enough, so I won't buy it again. I bought this product because they don't sell the C15 version yet in the EU. I've been trying this product for a few days now. I use a pea size amount of it after exfoliation and mix it with my skin balancing serum and apply it all over my face, I then apply the resist barrier repair moisturiser as well. I must say, my skin feels as soft as babys skin. I have combination skin and my skin feels almost normal and not as shiny or greasy (for some reason). This seems to be working well on my skin and my skin can tolerate this product when applied all over my face, which might not be the case for others. But overall, great product. Keep it up. Cyclopentasiloxane (hydration), Ascorbic Acid (vitamin C/antioxidant), Ethylhexyl Hydroxystearate (emollient), Polysilicone-14 (texture-enhancing), Dimethicone (texture-enhancing), Polymethylsilsesquioxane (texture-enhancing), Disteardimonium Hectorite (texture-enhancing), Propylene Carbonate (preservative). Can I use C25 Super Booster with a retinol or prescription retinoid product? Our C25 Super Booster beautifully complements the benefits of retinol, and research has proven that retinol is more effective when combined with vitamin C. Applied together, they are a formidable defense against free radical damage that ages skin, and both ingredients help to fade brown spots. Can I use C25 Super Booster with an AHA or BHA exfoliant? 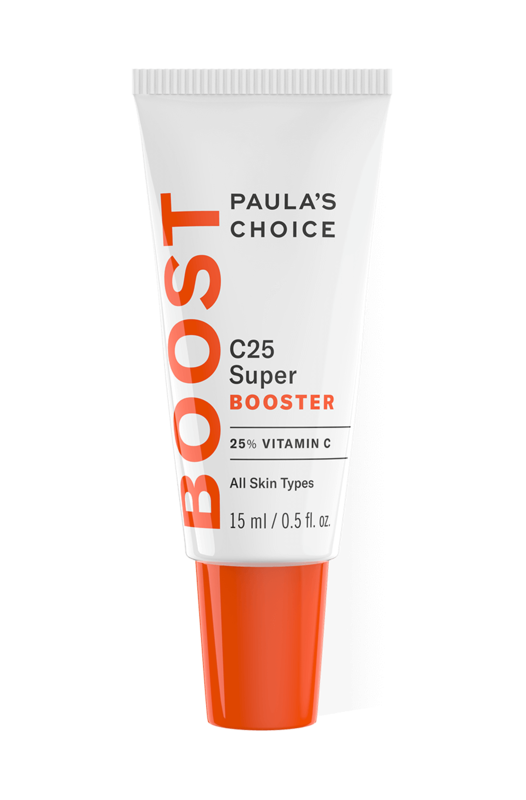 If you are already using an AHA or BHA exfoliant it is fine to use C25 Super Booster. If you’re new to using an AHA or BHA exfoliant, we suggest separating usage of the exfoliant and C25 Super Booster; for example, apply the exfoliant in the morning and C25 Super Booster at night.